An issue that seems to be confronting professional consultants with greater frequency is the viability of claims being brought against them by third parties, i.e, members of the public at large with whom there is no contractual duty. Recent case law sheds some light on such claims and provides insight into how defend against them. In the case of Sharon Reeser v. NGK North American, Inc., 2011 PA Super 17 (Jan 2011), a court held an engineer had no duty to warn the public of environmental conditions that it discovered while working for an owner of a beryllium plant to perform “stack testing.” The engineer found that beryllium emissions significantly exceeded allowable limits of the EPA, and the engineer so advised its client. It did not report the findings to any government agency or to the community. A woman in the community became ill with chronic beryllium disease and sued the engineer on the theory that it had a duty to inform the public of its findings. Summary judgment was granted for the engineer and affirmed on appeal. The court held that to have a duty to the public, the engineer would have had to have expressly undertaken a duty to protect the public and performed it negligently, and in this case the engineer undertook no such duty but instead undertook the duty to test the emissions and report correctly the results to the owner of the plant. It undertook no responsibility for the maintenance or safe design of the facility. In a case decided two years ago by Court of Appeals of Texas (Black + Vernooy Architects v. Smith), it was held that an Architect could be liable to a young woman who fell 20 feet and sustained permanent injuries when she fell from a balcony due to defective construction work that the Architect failed to report to its client – the homeowner – during its construction administration services. On reconsideration, the court reached the opposite conclusions from the previous holding – finding that the AIA B141 (1997) contract between the Architect and Owner only created contractual obligations of the architect to the owner, and it expressly precluded any third party beneficiary rights. As to the alleged common law duty, the court held there was no such duty because even if the plaintiff was a foreseeable user of the balcony that likely would be injured from defective work, the architect owed her no independent duty of care under the circumstances – particularly because the Architect did not perform the defective construction and its contract did not give it control over the contractor who did the work. The Architects’ agreement with the owner did not create duties of control over the contractor. The contract language that was favorably quoted by the court from the AIA is affirmation of the prudence of using standard form contracts such as those of the AIA and EJCDC whenever possible. The AIA forms contain appropriate language specifying the scope of services, the standard of care, and various responsibilities of the architect – and also articulates various matters for which the architect is not responsible – all as explained in this decision. When assisting design professionals in negotiating non-industry standard contracts with owners that have devised their own forms, this decision can provide a good road map for language to be included in those contracts. 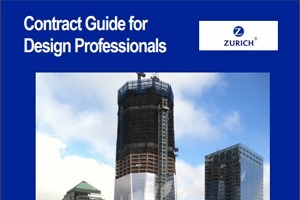 As noted by the court, if design professionals are to legally become the guarantors of the quality of work performed by contractors, the design professionals will either opt not to provide the service, or if they provide it, the fees charged will have to be significantly higher to justify the increased risk. With regard to the point about assuming the risk for higher fees, it is likely that most risk managers would advise against accepting guarantee and warranty responsibility regardless of how much extra fee the design professional might obtain, since this effectively creates liability for which the design professional has no professional liability insurance. For these reasons the court withdrew its 2010 decision and issued Black + Vernooy Architects v. Smith, 346 S.W. 3d 877, (TX 2011), thus rendering judgment in favor of the architects. Sometimes a court will find an independent duty is owed by a professional consultant to a third party because of the seriousness of the risk and special circumstances. An example of such a case is found in LeBlanc v. Logan Hilton, 974 N.E. 2d 34 (Mass. 2012). Approximately four or five years after completion of the Hilton Hotel at the Boston Logan Airport, an employee of the airport authority was electrocuted while attempting to repair an electrical transformer that lacked required wiring diagrams and warning signs. The family of the deceased filed suit against the owner of the hotel as well as the architect that designed it, the consultant that did the electrical engineering services, and general contractor, and the electrical subcontractor, alleging negligence, gross negligence and breach of warranty. The hotel filed cross claims against the architect and the electrical engineer seeking indemnification and contribution. The Supreme Court of Massachusetts held that claims for contribution were proper because the consultant owed an independent duty of care to the electrician to comply with its contractual obligations to the project owner to get the contractor to provide proper warning labels on the switchgear, and there were issues of fact to be determined by a jury as to whether the worker’s death was caused by the design firms’ failure to report that the contractors had not complied with the specifications. This was despite AIA contract virtually identical to that in the Texas case. With regard to the question of whether summary judgment should have been granted as to causation, the Massachusetts Supreme Court concluded that “there is a genuine issue of material fact whether reporting the deficiencies to Hilton and refusing to declare the project completed until the deficiencies were corrected would have caused the mimic bus diagram and warning signage to be installed before [the maintenance worker] was electrocuted.” In other words, the court is saying that the Design Team’s failure to do what it was supposed to do per its contract for the project owner could be professional negligence as to the third party, and a jury must be permitted to decide whether the negligent breach of the contract “caused” the death of the worker. Although different results can be reached depending upon the factual circumstances, and depending upon what state court is reviewing a case, an over-riding theme that is seen in the cases is the importance of contract language to establish the scope of service and the limitations upon what is expected of the professional consultants. Use of standard form language from the AIA or EJCDC contract forms can be quite useful. If using an owner-generated contract form, it can be beneficial to review and revise that form to establish site observation language and duty of care language similar to the standard forms.